for 350,000 people to decrease total number of immigrants. Presidents since Dwight D. Eisenhower have granted “temporary protection” to foreign nationals in the United States who are unable to return to their home countries because of extraordinary circumstances, such as violent conflict or natural disaster. In 1990, Congress codified this practice by creating Temporary Protected Status (TPS). Now the Trump administration is considering ending TPS as a way to decrease the total number of immigrants. This would affect approximately 325,000 people in the United States. TPS provides a work permit and reprieve from deportation for six to 18 months (and can be extended) to immigrants from some countries recovering from violent conflicts, natural disasters or epidemics. According to the Congressional Research Service, the largest group of TPS recipients is from El Salvador (195,000), followed by Honduras (57,000) and Haiti (50,000). When the U.S. Department of Homeland Security extended TPS benefits for Haitians by six months in May, federal officials noted that the extension was meant to give the Haitians enough time to leave the country and for the Caribbean nation to receive them. With a deadline of January 22 looming and no signals from federal officials that TPS would be extended again, though it could be, thousands of Haitians have reportedly walked across the border to Canada to seek asylum there. Many TPS recipients from other countries are fearful that the Trump administration may allow their status to expire as well, without consideration of the current conditions and dangers they would face if sent back to their home countries. The current expiration date for TPS for Hondurans is January 5 and for Salvadorans, March 9. 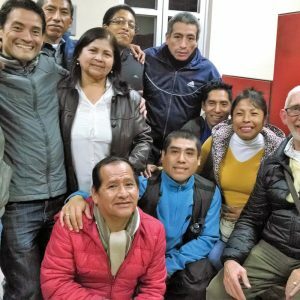 Last July, the Center for Migration Studies, an educational institute in New York that was founded by the Scalabrinian Missionaries, released a report describing the TPS recipients from El Salvador, Honduras and Haiti as hardworking people with strong family and other ties to the United States. High percentages have lived in the United States for 20 years or more, participate in the labor force at a much higher rate than the total U.S. population, speak English well, arrived as children, and have children who were born here and thus are U.S. citizens. The TPS recipients from El Salvador, Honduras and Haiti make significant economic contributions by maintaining home mortgages, paying taxes and working in industries crucial to the economy, such as construction, child care and health care. After many years of uncertainty, these vulnerable people are where they are safe, most able to maintain strong family ties and are making valuable contributions to society. •Read and share the Center for Migration Studies report about U.S. Temporary Protected Status (TPS) populations from El Salvador, Honduras and Haiti. • Download the “Save TPS” Toolkit produced by Alianza Americas, a network of immigrant organizations from Latin America and the Caribbean in the United States. The toolkit contains talking points to prepare for a meeting with your elected officials and more. • Call or send a letter to your members of Congress urging them to join their fellow members of Congress in asking the Secretary of Homeland Security to save TPS. • Pray, study and act with the “Advent Reflection Guide for 2017, A Season to Welcome the Stranger” by the Maryknoll Office for Global Concerns.